A monument commemorates the 140th anniversary of Stuart`s discovery of water in Stuart Creek in 1858. John McDouall Stuart passed through this region on his first expedition, and on Saturday 26th June 1858 found permanent waters in a creek, approximately 40 kilometres south-west of Curdimurka. He named the site Chambers Creek, later changed to Stuart Creek. 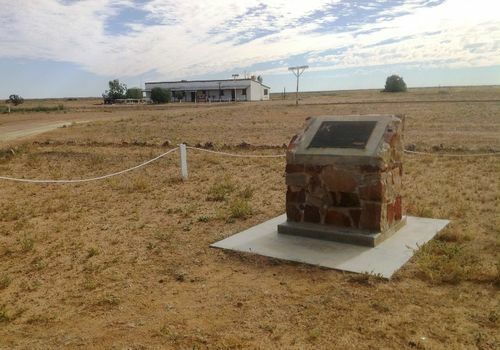 A waterhole served as the 'staging' camp for Stuart's five subsequent expeditions. This important discovery opened a route to the Centre and for the south to north crossing of Australia. On his fourth expedition, Stuart, William Darton Kekwick and Benjamin Head departed Stuart Creek on 2nd March 1860 and were the first known Europeans to reach the Centre of Australia - 21st April 1860. His last expedition, The South Australian Great Northern Exploring Expedition, completed the first European crossing of the Continent from Adelaide to the Indian Ocean, passing through the Centre and returning along the same route with no loss of life. The part of 10 men and 72 horses departed Stuart Creek on 8th January 1862. The Overland Telegraph Line linking Adelaide to Europe via Darwin (1870-72) was constructed along this route. Subsequently the original Central Australia Railway (The Ghan) which reaches Alice Springs in 1929 followed a similar route. assisted by The Ghan Railway Preservation Society (S.A.) Inc. Unveiled on 26th June 1998, 140 Years after Stuart's Discovery.